The dimensions for Engage interactions are fixed at 720 pixels wide by 540 pixels high. If your PowerPoint dimensions are anything other than 10 inches wide by 7.5 inches high, embedded interactions will be centered on the slide and, if necessary, scaled down to fit within the slide. Also, when embedding an interaction in Presenter, the player colors in Presenter take precedence over the player colors in Engage. Be sure to set your player colors in Presenter. Go to the Home tab, and click Publish. From any tab, click the Preview drop-down, and choose Publish. Click the round Articulate button in the upper left corner, and choose Publish. When the Publish window appears, click the Articulate Presenter tab on the left edge. 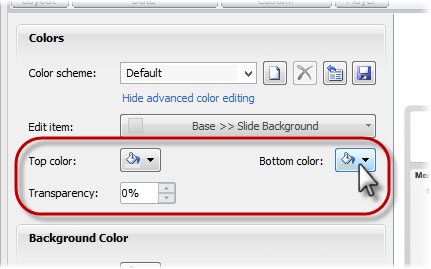 Select the PowerPoint presentation into which you want to publish. Only presentations that are currently open will display in the list. If the presentation you want isn't listed, click the ellipsis (...) button to browse for it. If you want to change your Theme Colors, click the blue text to open the Interaction Properties window where you can select a different theme. Click OK to return to the Publish dialog. 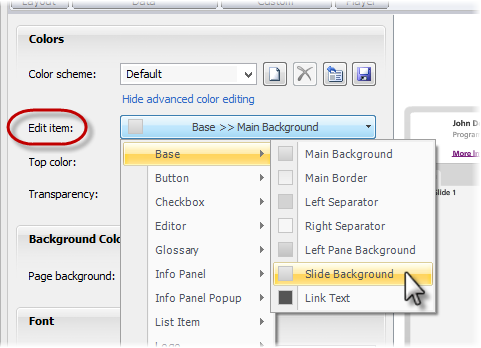 To learn more about theme colors, see this tutorial. If you want to change the Playback Mode, click the blue text to open the Interaction Properties window. Select a different mode, and click OK to return the Publish dialog. To learn more about playback modes, see this tutorial. Click the Publish button in the lower right corner to complete the process. When the Publish Successful dialog appears, click Close. After publishing an interaction to Presenter, switch over to PowerPoint. 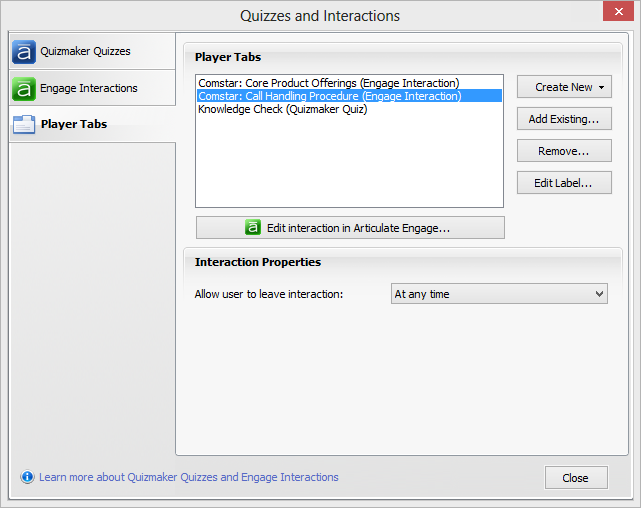 The Quizzes and Interactions window will be displayed, waiting for you to customize the properties for your newly published interaction. If you chose to insert your interaction as a slide, it'll open to the Engage interactions tab. If you chose to insert it as a tab on your course player, it'll open to the Player Tabs tab. Use the following options to customize the properties for your interaction, depending on how you chose to insert it. 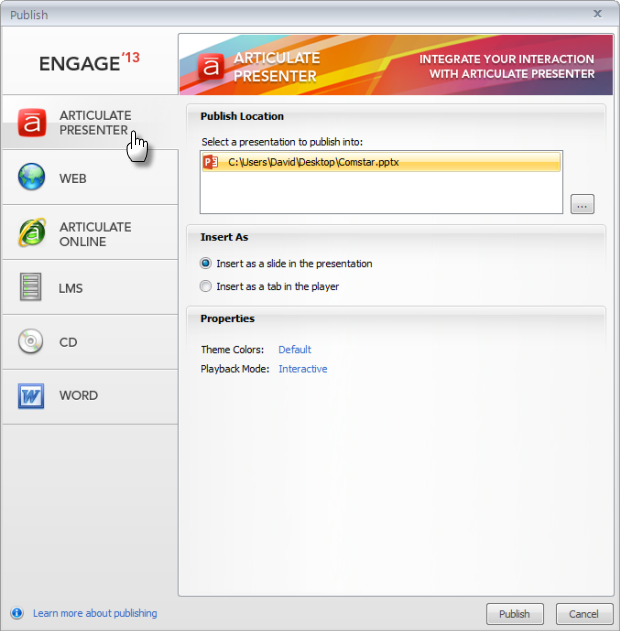 Edit interaction in Articulate Engage: Click this button if you need to make changes to the interaction itself. It'll open in Engage. 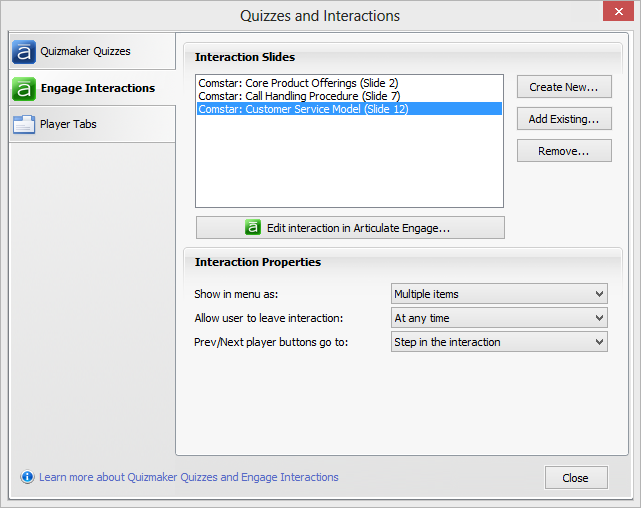 When you finish editing the interaction, click the Save and Return to Presenter button on the Engage ribbon. Show in menu as: Choose whether your interaction will display as a Single item in the player menu or as Multiple items (one for each step in your interaction). Allow user to leave interaction: Choose whether learners will be able to jump to another slide in your course At any time or only After viewing all the steps in the interaction. Edit Label: Click this button if you want to change the text that's used for the tab that appears on the top bar of your course player. Type the new name, and click OK. Allow user to leave interaction: Choose whether learners will be able to close the player tab and return to your course At any time or only After viewing all the steps in the interaction. If you change your mind about these settings later, don't worry. You can edit them at any time. See this tutorial.